Isaac Asimov, one of the world’s best-selling authors, a scientist, academic, romantic, and original thinker, here jousts and jests with his old opponent in the war of words, John Ciardi. Ciardi, of course, is a poet, world authority on and pemier translator of Dante, teacher, critic, and formidable manufacturer and weilder of the word-weapon. Hurling limericks at each other, a dozen at a clip, they charge from the lists (the list includes a gross of limericks by each). It is a brilliant confrontation in one of the English language’s oldest and most demandingly rigid traditions. This volume and its companion, A Grossery of Limericks, have a couple of unusual features. One is the presence of a collaborator. Asimov rarely collaborated willingly, and these two books are among the exceptions. John Ciardi was a respected and successful poet, best known for his vigorous translation of Dante’s Divine Comedy. He and Asimov met at the annual Breadloaf Writing Workshop in 1951 and they became good friends shortly thereafter. When Asimov published his earlier collections of “lecherous” limericks, he ribbed Ciardi that he, too, was now a poet. Ciardi took the bait, and Asimov shortly received a typescript of 144 (one gross) of bawdy limericks and an invitation (or challenge?) to add another gross. This particular book is the result. Another unusual feature is the book’s relative success. (This is doubtless Ciardi’s influence.) 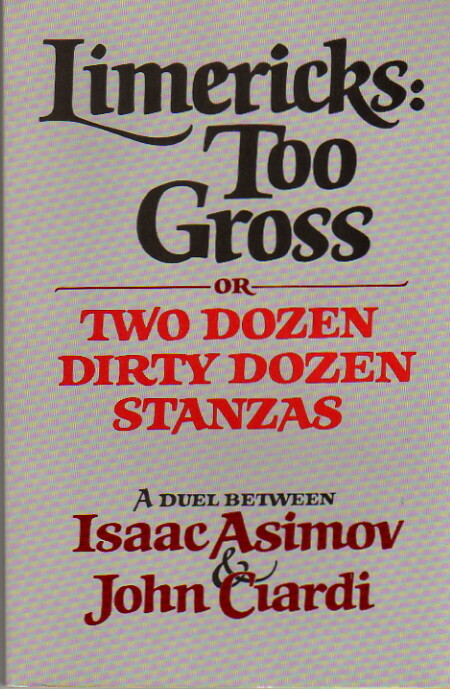 Asimov’s other limerick volumes didn’t do very badly, but neither did they last on bookstore shelves very long. This volume, however, tenaciously remained in print long after the other bawdy limerick books. Finally, it actually gets mentioned in the Encyclopedia Brittanica in its article on Ciardi. Unfortunately I personally don’t care for it very much. It has been pointed out that I probably took this book too seriously when I first reviewed it, but I don’t think that’s the case. None of Asimov’s limerick books really tickle my fancy, and I even tried a book of clean limericks by Ciardi, The Hopeful Trout, which includes illustrations by Susan Meddaugh—Meddaugh’s solo efforts such as Tree of Birds were longtime bedtime staples around our house. No luck. I was still left cold. My six-year-old loved it and mourned when we had to take it back to the library, but it did nothing for me. I guess I just don’t care for limericks. Even allowing for my personal tastes, this probably isn’t the best introduction to the work of either man. Still, Asimov and Ciardi had fun writing it, and I’m sure that someone who enjoys bawdy limericks should have a pleasant couple of hours chuckling through it.